Tom McDermott returned to where his career began over the weekend, to win the NSW Country Showjumping Championships 2018, while riding Elegance De La Charmille. Tom now sits in the box seat chasing the NSW Triple Crown Series title for 2018, which includes an incredible bonus of $50,000—making his prize, if he wins through the Willinga Park Grand Final 2018, the largest of any Australian showjumper in 2018. 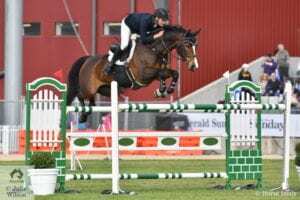 While Tom started his career as a showjumper in Wagga Wagga, when his dad was training racehorses at the local racecourse, today he is regarded as one of Australia’s top showjumpers. To win the $50,000 bonus, Tom must now take top prize at the NSW State Titles (10-14 October) and first at the Willinga Park Grand Final 2018 (13-16 December) while riding the 8-year-old mare, Elegance De La Charmille. Should Tom not win all three senior titles, then the best performed will receive $5000, and the prize for the runner-up will be $2500. There’s still plenty on offer for other riders in the next two events with bonus money paid for the leading Junior, Young Rider, Amateur, Mini Prix, Futurity combinations at Willinga Park in December. All categories are competing for $1000 for the best performed across all shows and $500 for the runner-up. and helped riders cultivate their horses for a series of premium events. Ultimately, it will raise the bar of Australia’s showjumping talent.